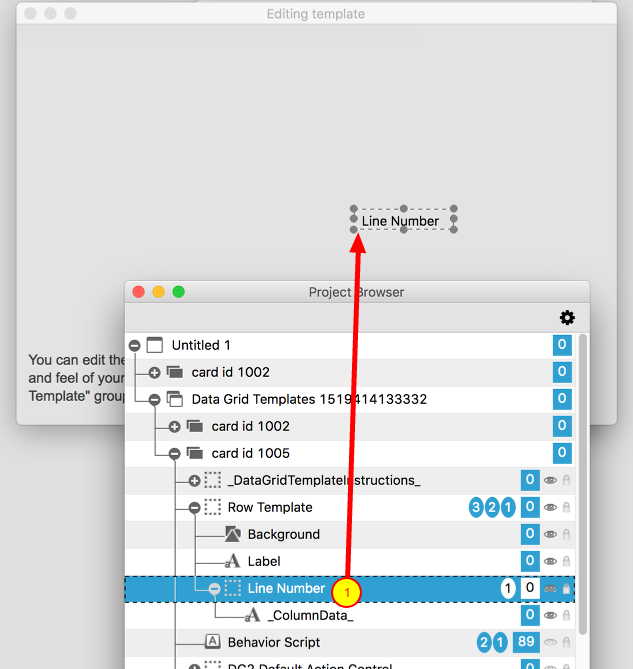 LiveCode LessonsData GridLiveCode Data Grid Working With Data Grid TablesHow Do I Display Line Numbers in a Table? This lesson will show you how to dynamically display line numbers in your data grid table. Here is the table that I will display line numbers in. Select the data grid and open the property inspector. Select the Columns pane (1) and add a column using the "+" button (2). 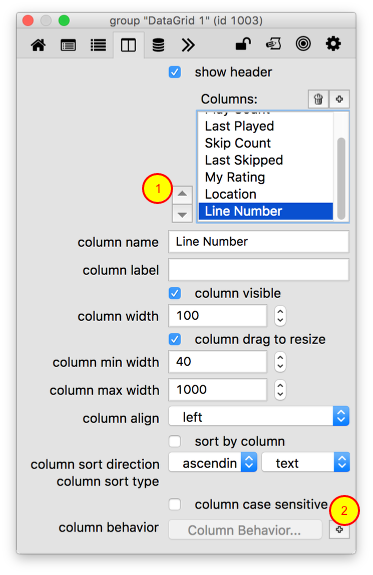 Rename the column "Line Number" (3). 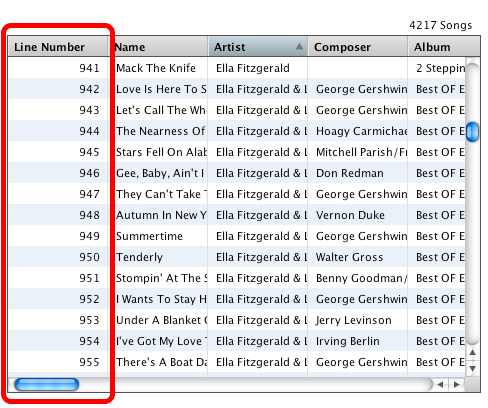 Use the up arrow (1) to move the Line Number column to the top of the list. Create a template for this column by clicking on the "+" button at the bottom of the property inspector (2). After creating the column template the card with the template group will open. Now all that is left is to define the behavior for this column. 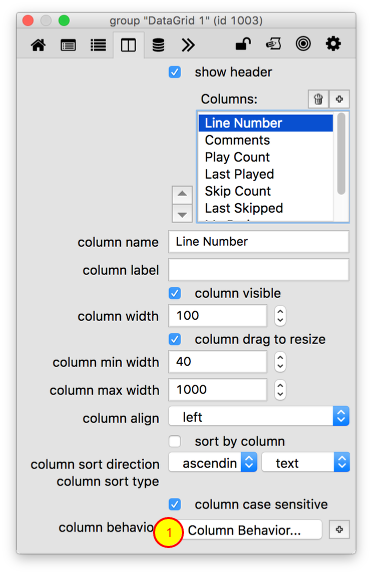 Back in the Columns pane click the Column Behavior button (1) to open the script editor. There isn't much to do here. 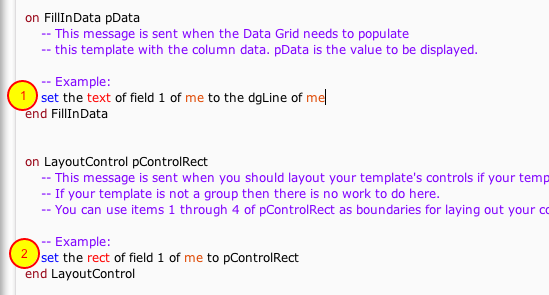 In FillInData you just want to 'set the text of field 1 of me to the dgLine of me' (1). The dgLine is a property of a row template and this will display the line number for the current line. In LayoutControl you just need to set the rect of the field so that it fills the entire cell (2). In the property inspector click the Refresh Data Grid button. Now the line numbers appear in the table. But How Do I Set the dgText Then? 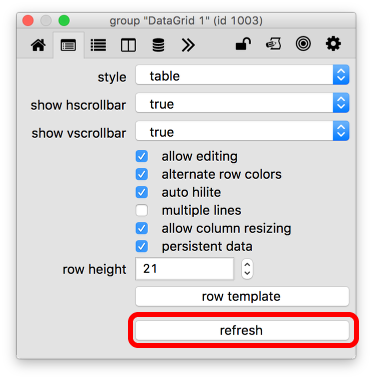 You may be wondering how you would set the dgText property of this data grid since we have added a "Line Number" column as the first column in the table. Prev: What If I Need to Work With htmlText, rtfText or unicodeText? 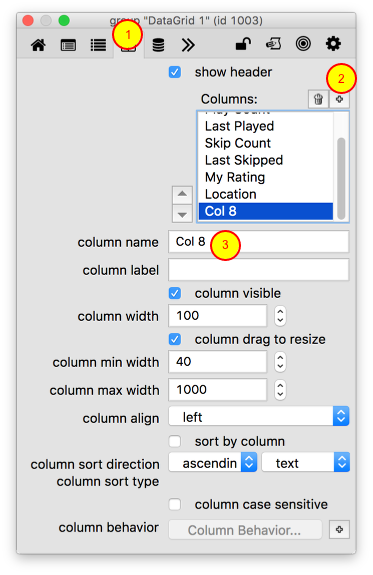 Next: How Do I Customize Column Sorting? Is it possible to set dgText or dgData with a data set or array that has an unspecified number of columns (I don't know the size of the array in advance)? In other words, can I upload theData to a data grid that has not been pre-formatted with column names, i.e. creating the number of columns and column names from within a script? 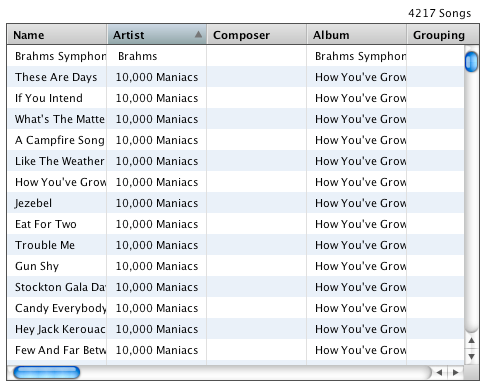 @Michael: You can create the columns by setting the dgProps["columns"] property of the Data Grid. set the dgProps["columns"] of group "DataGrid" to "Col 1" & cr & "Col 2"
However, it seems that I should be able to simply assign a column to be at a specific number, with the one at that location and all subsequent ones incremented by 1. Any suggestions greatly appreciated. @Nate - the method you are using to reorder columns is the only way to change the order right now.